This procedure requires less that 10 minutes of your time. Together with the waiting time for the servers to update, the domain switch takes from 50 minutes to few hours to complete. As this is completed in less than a day, you can perform the transfer just a few days before the renewal date your domain. Why would you want to transfer from Godaddy to Namecheap? Both companies offer quality services in domain registration, hosting and email. Pricing might be a factor to move from one to the other. Log in to GoDaddy and make sure your domain contact emails for the specific domain are correct (registrar, administrative, technical, billing). You will need to have access to the administrative email to complete the transfer. If the contact details are not correct, and you try to correct them, you might lock the domain for 60 days. During the 60 days you will not be able to make any transfers. On GoDaddy, go to your Account -> Products -> Manage (domain) and disable the domain lock (if you have it ON). It may take quite a few minutes for the changes to appear in the control panel. On GoDaddy, go to Domain settings, remove domain privacy (if you have it ON). It may take a few minutes for the changes to appear in the control panel. Wait a few minutes for the changes to be applied and made visible in the GoDaddy control panel. On GoDaddy, go and ask for the authorisation code. The authorisation code will be sent to your administrative email of your account. You will need it when purchasing the domain transfer on NameCheap. On Namecheap, request transfer and pay for it (promo code: BACK2SKOOL). Namecheap give you a free year of "whois guard" (privacy for your personal details when querying the "who is" servers). Add WhoIs Guard to the cart. After 10', on goddady, go to transfer-out domains and Accept it, or wait for an email reminder for it. 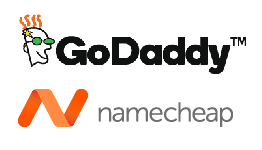 After 10', you receive an email saying "This is to confirm that the following domain names have been successfully transferred away from GoDaddy to 5206-NC"
You may receive an email from namecheap to verify the owner details. You need to click a link to verify the details. Check and if needed restore DNS settings and any other settings (e.g. email forwarders). If your web hosting was on Godaddy and it remains there, you may not need to make any DNS settings on NameCheap as the ones picked automatically are still valid. Change first the name servers to Basic NameCheap server. This will give you access to Advanced DNS. Put the name servers that your hosting provider give you.